Focal unveils Sopra 3 speaker, plus centre, surround and sub | What Hi-Fi? French audio manufacturer Focal has added a pair of floorstanding speakers, a centre speaker, surround speakers and a subwoofer to the Sopra range to allow consumers to create a complete surround sound system. The new additions have been launched at High End in Munich, with the new Sopra No.3 floorstanders joining the existing Sopra 1 and 2 speakers. The Sopra 3 is the biggest and most powerful speaker in the range, thanks to a 35 per cent bigger cabinet that sports a 60 per cent bigger bass section. This is necessary to allow for two new 8.25in bass drivers, up from the 7in drivers in the Sopra 2. A rich, controlled bass is said to be the end result. Focal says its engineers have completely redesigned the internal structure of the No. 3 to help it “push the limits of sound reproduction”, including the company's Infinite Horn Loading (IHL) technology and two new crossovers, one for bass and one for the midrange and tweeter. The woofer uses Focal’s Tuned Mass Damping (TMD) technology, which counterbalances any resonances caused by the movement of the driver - the surround around the cone can cause distortion, so TMD does its best to minimise this. The company's Neutral Inductance Circuit (NIC) meanwhile aims to stabilise the magnetic field around the voice coil to again keep distortion to a minimum. The tweeter is borrowed from the flagship Utopia range, while the cabinet strives to deliver the same high build quality of the flagship. Based on past Focal reviews, we'd be pretty confident. The Sopra No. 3 will be available from June for €18,000 per pair. While the Sopra No.3 can be used as a pair of stereo speakers, you can also use them as part of a home cinema system. The Surround Be effect speakers can be used with the Sopra range, and also the Electra and some Utopia III systems. The Be features a ‘Bi/Twin” structure with twin inputs, this, says Focal, allows it to be used in both 5.1 and 7.1 configurations. All good surround systems need some decent low-end power, and the SW 1000 BE subwoofer aims to oblige. It’s an amplified bass-reflex sub that features a 600-watt BASH amplifier - a Class AB/Class D hybrid - and a 13in woofer. Finally, the Sopra Center is a compact centre speaker that has a design to complement the rest of the range. 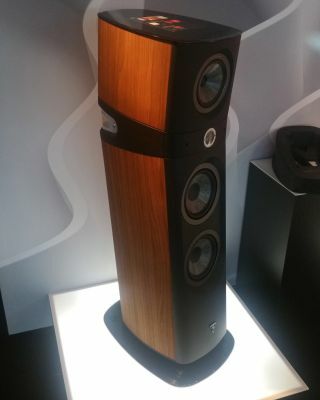 The Center, Surround Be and SW 1000 Be will all be available from June, for €2499, €1999 and €3499 respectively.